The Northeast Ohio Coalition for the Homeless has struggled with what to do with grievances in Cleveland. Here is a copy of the flyer to print out and distribute. We discussed the reason behind this decision back in March and posted it here. We also discussed these decisions with the residents of the shelter at the March Homeless Congress Meeting here. It was a painful decision and we have had a women desperately calling us for a week to ask for help. She was pleading and begging me to try it one more time. We found it only harmed homeless people and was not helpful to improving the shelters. 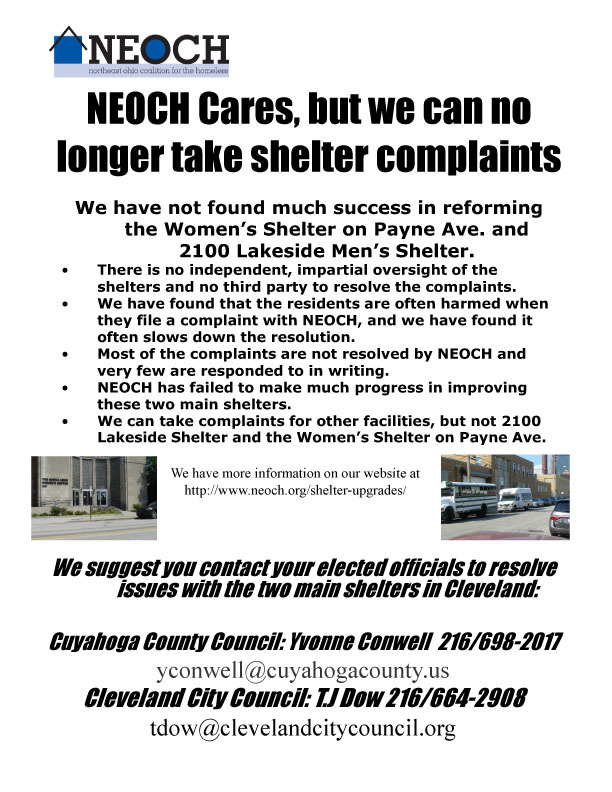 Until there is a legitimate third party complaint process with some teeth, NEOCH has no hope of helping these residents to equitably resolve their grievances. We suggest calling or e-mailing your County Councilmember or the City Council member for the two largest shelters. They probably will not be able to help, but at least they answer their phone. Every other place that we could thing of does not even answer their phone so it is not worth using cell phone minutes.